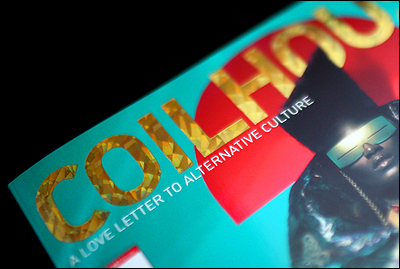 When we discovered Coilhouse Magazine a few months ago, we were over the moon! What a great mag! Gorgeous artwork and photography combined with interesting and relevant stories make this periodical a must-have. So, when we chose to place an advertisement in their upcoming issue, imagine how nervous we were! It was very important to us that we honor the aesthetic of the magazine as well as properly promote our brand. So, with the fantastic design work of Main Vine Studio‘s Robin Norris, and a little help from Nadya and Courtney at Coilhouse, we arrived at what we think is a beautiful solution. AND, there’s a coupon code for goodies ordered from www.frenzyuniverse.com! Now, Issue 5 of Coilhouse Magazine is on newsstands across the country. Word on the street is that the website is nearly (if not completely) sold out, but you may still be able to score a copy in person! Check out your local independent bookstore, or swing over to Barnes&Noble or Borders, to see if they’ve got this magazine in stock! In addition to getting to see our ad, you’ll find stories about Tiffa Novoa, Chet Zar, Clive Barker, Wil Wheaton, Ali Mahdavi, and many more! We were lucky enough to meet Wil Wheaton at GenCon and have him sign our copy of the magazine!